Why don’t we see ocean acidification in over a decade of high-frequency observations in the Gulf of Maine? The answer lies in a recent decade of changes that raised sea surface temperature and salinity, and in turn dampened the expected acidification signal and caused the saturation states of calcite minerals to increase. From 2004 to 2014, sea surface temperatures in the Gulf of Maine were higher than any observations recorded in the region over the past 150 years. This greatly impacted both CO2 solubility and the sea surface carbonate system, as detailed in a recent paper in Biogeochemistry. Over the 34 years of the time-series, the recent event is extreme, but interannual and decadal salinity and temperature variability also influenced carbonate system parameters, which makes it difficult to isolate and quantify an anthropogenic ocean acidification signal, especially if relying on shorter-term observations (Figure 1). Figure 1: Modeled ΩAragonite (top panel) and pH (bottom panel) anomalies relative to monthly 2004 data. 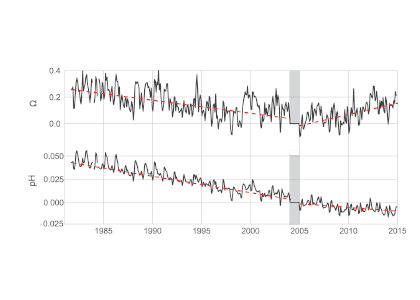 The red lines show trends prior to and after 2004, after which warming accelerated. For those with a stake in profiting from or managing extractive resources that are susceptible to ocean acidification such as commercially important lobster and bivalves, understanding how ecosystems will be affected is critical. 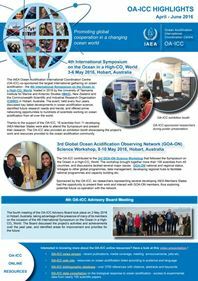 These analyses clearly demonstrate how physical processes can either accelerate or mitigate ocean carbonate system changes, thus confounding the detection of ocean acidification that is expected from increasing atmospheric carbon dioxide. To assess whether an ecosystem or species is at risk or aided by such processes, it is important to observe, understand, and be able to model all sources of carbonate system variability. 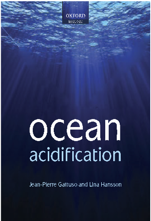 Joe Salisbury & Bror Jönsson, Ocean Carbon and Biogeochemistry (OCB). Article.